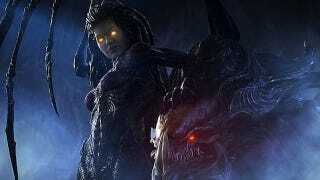 In a patch to the Heart of the Swarm beta released yesterday, Blizzard added some much-needed—and dare I say awesome—new features to StarCraft II. And they all had to do with replay. We've known for a while now that Blizzard was planning to introduce a system where a dropped game could be recovered from a replay, and it finally launched yesterday. While this will be nice when you're playing casually with a friend and your game crashes out, the real utility is in tournament play. No more slipping that punishing Broodlord/Infestor noose because of server issues, Terran players. But Blizzard didn't stop there. The coolest part of this new replay system is a little fantasy-fulfiller called Take Command. With Take Command, this "replay restart" isn't restricted to games that crashed. You and a friend can jump into any replay at any point and play from there. It doesn't even have to be your own replay! Much like strapping on the Jordan 1's in NBA 2K11, you can now hop into the shoes of a seasoned Team Liquid member in the middle of a classic match. A library of professional matches are now at your fingertips, ready to be played from any point, be it five minutes in or the epic last stand. Or just play out alterna-versions of your own matches where you win frustrating losses. Either/or. More details over on Battle.net. Should Competitive Gaming Be On National TV? Experts Are Divided.